Comments on "September GQ from Paris"
Wow! 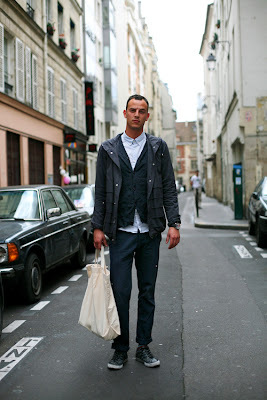 I am blown aaway by the fact that monsieur numero une is wearing red docs and they look great! Just came across your blog. Very striking! And you get to do this for a living. Auguri! I just saw your Stockholm series. When are you making it to Buenos Aires? oh i love the first picture! red doc martens look good with red socks also! I've just bought the 8 hole version of those shoes, they're fabulous! Great looks! Love the shoes on the first photo! More models wearing their little brothers clothes. It's outfits like this that turn regular guys off to fashion. From afar, the man's blazer looks striking. But up close, it seems to be a tad too short, making the look seem a bit cheap. that was the only one i couldn't remember perfectly! I kept remembering an accent but i couldn't remember what kind, i had not planned on that to be part of the page. 1st photo... I like the shoes, the jeans, the shirt, but what about blazer? Forget the rules and everything, it just doesn't flatters him. I love, love, love the first lad, his entire look comes together thanks to his shoes. I believe those red shoes of his are Doc Martens? The German model is just as stylish. I love coming to your blog and being visually inspired. Top guy: here's how you handle shorter proportions if you're tall. And tall and skinny this guy certainly is. An Anon 9:36, am desolated to think that this look will turn "regular guys" off fashion. What do you think will bring them back? Dockers and crew-neck t-shirts? Cargo shorts with flip-flops? Both guys are wearing clothes too small for them,the lower one less so.As pictures these are ok. I have to say that I find the move to attempt to redefine fit very troubling. The clean lines and interesting detail here are completely lost on the majority, and rightfully so, by designers (and their customers) who choose to ignore hundreds of years of basic tailoring. the black guy just looks awesome! great style! oh my! the man in the first picture is seriously channeling jean-michel. Is it okay to wear doc martens? i agree that he makes them look great, but can anyone else (aka me: a woman)? I have held on to those purple doc boots I used to wear in middle school for years. Could it be the time to bust them out of the closet again? Thoughts? Being new myself, Elastichica, Welcome. Keep the heat on him to explore Buenos Aires, stylish and colorful scene! I,too envy/admire Sart, what a wonderful career choice! 'Grats! However, I envy the red on red even more! Urban Parisien! I couldn't pull it off, but I like. Got to say this, please. I'm a regular guy who too doesn't embrace fashion. “Fashion is the science of appearance, and it inspires one with the desire to seem rather than to be." But style is what a regular guy should have. Style is what The Sart's camera catches. quick comment for the "regular guy" the person is a regular guy not a model and your attitude will never allow you to understand or accept that ones "outfit" is his personal expression and is not to turn you on to fashion. you find your inspiration in what you like and go from there, just try to keep more of an open mind. Let's hope these transplants are not going to turn the beautiful streets of Paris into an evil shithole like London. If this is how you think men in Paris dress you are far off the mark. Hm, they both have their top shirt buttons buttoned, I'm seeing this look more and more these days. More 80s influence I suppose, although I remember your depression-era post from a while back featured that as well. It's a good look, I like it. Reminds me of David Byrne. oooh love the updated punk vibe, esp. on #1! foxy! If more 'regular guys' rocked this look, they'd do so much better with the ladies! Are those really red Docs? I had no idea that they were sold for men (I looked hard for them a few years back). Or is he wearing a large set of women's red Docs? If they're not Docs, I'd be interested to know the brand. Wow. What a great post for a Monday! Both of these guys are my idea of foxy. Very slick. love this look on both men. the first guy reminds me of basquiat -- in a good way. ah, *sigh* the beloved red docs. i really prefer doc boots, but i'll take these as a temp. fix. thanks. The first guy is very beautiful. And I like the idea, but not the fit of his clothes. But he looks very tall, and I bet he'd have to have his clothes custom made to really get a good fit. (As a tall woman, I find it very difficult to find clothes that fit.) Of course maybe it's just the Thom Browne influence. But the low crotch of the jeans and the small jacket really lengthen his torso. The colors are great though, as is his hair. Very "now" fashion and pretty cool. I do agree with those who have said that the jacket sleeves on gent wearing the red Docs are just too short. They look awkward rather than edgy. I don't know if it is the cut of his clothing, or the setting in which the picture was taken, but the man in the first photo looks like he is about 8 feet tall. I love the idea that he would choose a silhouette to emphasize these proportions and his height. Both look long and lean and yummy. Confident and hot. Why don't your pics come with numbers and relationship status? I love both pics, however the top chap steals the show. The red doc martins and socks combo is set off beautifully by the small turn ups on the jeans. The fellow looks familiar, I think i've seen him working in Dover St market but I could be mistaken. Regardless, i love his style. I certainly don't agree with anonymous about him wearing his little brother's clothes! Damn these silly anonymous comments. 1. I think a true indicator of personal style is one no one piece sticks out (like an IT bag or a ridiculous pair of sunglasses), everything about his look has a unfussy cohesiveness to it. I esp. like the overall shrunken theme. 2. I like the side details of his jacket. Nice watch too. saw these in GQ, great to see them larger! 10/10 to both of them. This shouldn't turn regular guys OFF fashion (as one person posted,) it should make regular guys want to up their game. Both of the prove that looking sharp really isn't that difficult. Agree with first comment. Maybe Docs CAN look good in a fashion context? While I've started wearing my clothes a little shorter in the arms and legs, I have to agree a little with the anonymous comment that these are basically thin men wearing fitted clothes. Not sure how much "style" there is to their outfits, although they undeniably look good. I'd like to see more body types on The Sartorialist, like the Harlem pictures. Having said that your eye for a shot shames every other fashion blogger. I absolutely love what both of these men are wearing, more so the guy wearing the red Doc Martens. He looks perfect, and as a tall, skinny young man myself, i have nothing but respect for his sensible fashion sense. He is IN, he is NOW. Well dressed men don't wear baggy clothes, everything is fitted, tailored to one's figure, I love. Thomas I agree with the whole Harlem look editions, the picture "On the Street...Modern T Monk, New York" is unreal! I actually tried to emulate the look, minus the hair though. Your statement of style is equally true and a god-forsaken overdone topic. Every shot on here (The Sartorialist eye is unreal and his camera deserves to bare the mark of style.com)has style. Albeit not "stylish" the so-called guidelines of style. Fashion=trend ("That's hot! ")Stylish=clean ("Nice Fit"). IMHO... but what do I know? My clothes just started fitting me! I would say that I really like number 1's outfit, IF everything wasn't so skinny and shrunken. The colours and textures are great, but all this is lost in proportion. I used to think that skinny trousers, and shrunken blazers were wonderful, but with a little help from my much older, experienced friend, I now see that its just a fad. Classic fitting suits will always look amazing and classy. I'm glad he came with me when I bought myself two suits this past June. i'll buy the red socks. i promise. slick. i love these kinds of silhouettes for men. something sort of beatnik nostalgic. that guy should be a model if he's not, he's gorgeous. Monkeyboy: Originally Docs came in only one colour - Cherry Red. And only in man sizes. Nowadays I believe both the black and cherry reds come in every size available. The classic ones are still the 8-eyelet 1460's - in Cherry red of course. Hey,am I the only one picking up some skinhead vibes? Anyway. Very cool indeed. love the red docks. and his jeans look awesome too. Great styles - the silhouettes, the color combinations, the styling, they work! More please! I don't like that shrunkin look though I know it's now trendy due to that designer whose name I forget. These have nothing to do with fashion. They are about style. Hullo numero uno! Love the hair! And the boots and the fit of everything. Such a sucker for men in skinny jeans, I am. I love how he's young enough to know that his fun hair and shoes will actually take the edge off a severe fit. Clothes don't have to wear the young'un, but they sure do look nice on him! Number one is elegant and beautiful. Love his style, but clothes, regardless of the cut, should fit. His jacket sleeves are just too short, and because of that, he looks gangly. Love the shoes. The guy in the first picture is everywhere!!! I picked up a Japanese Men's Non-No magazine today and he had a whole page dedicated to his street style. He deserves it though, he's amazing! It seems like red socks are a big hit, I wouldn't really wear them though: they'd make me feel my feet are on fire! I like both styles, but the second's my favorite: red socks + red shoes are just too much for mee! i think both guys look fantastic, but the black guy steals first prize. i've seem him in magazines like mens nono and he always looks top form. his style is so unique and forward thinking and i disagree with the notion that both guys clothes are too small. whats wrong with a bit of individuality and mould-breaking. keep up the good work guys. inspiring! The second one doesn't work on the dover street market. He has a store in Copenhagen called IL.